I love pasta almost as much as I love Mexican food. Any shape or size, give me a sauce and some Parmesan cheese and I will have at it! Unfortunately not all of my family shares in my love. However, since I do the cooking I am able to pop it on the menu as much as I want. One of the perks I enjoy about being in charge of the kitchen. Plus I can just say “Hey I am a food blogger. I have to give the people what they want”. That seems to quiet them down. 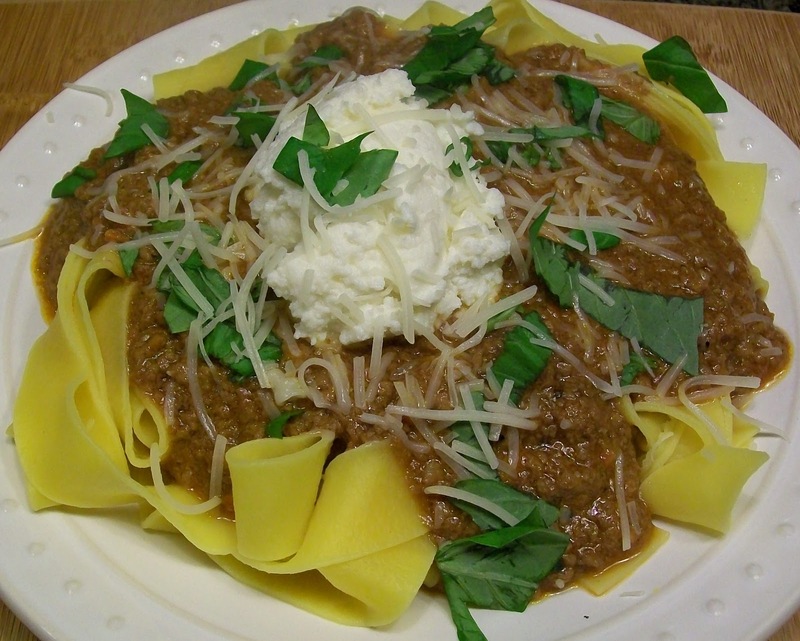 I had been wanting to try a bolognese sauce for quite some time. I was just worried because everyone I talked to made it seem like it was such a hard sauce to make. Once I tried it I asked myself what in the heck took me so long! Yes, it takes a while to make but trust me, it is well worth the work. The sauce is so creamy and rich. It is just a huge hug for your tummy! This was one pasta that everyone enjoyed. Don’t pass up the ricotta cheese on top either. It was icing on the cake! I will keep this on on the list of recipes to do again. I know you will love it too! Puree the mushrooms, pancetta, onion, celery stalks, carrots, garlic, together in a blender. In a heavy-bottomed pot add olive oil, bay leaves, herbs and cook gently until fragrant, then add vegetable puree and continue to cook for a further 5 to 10 minutes. Raise the heat a bit and add the ground pork and beef; brown until the meat is no longer pink, breaking up the clumps with a wooden spoon. Add the milk and simmer until the liquid is evaporated, about 10 minutes. Carefully pour in the tomatoes, and wine and season with salt and pepper. Bring the sauce to a boil, then lower the heat and cover. Slowly simmer for 1 1/2 to 2 hours, stirring now and then, until the sauce is very thick. Taste again for salt and pepper. I know I have mentioned, on many an occasion, that I have a love of all things soup. It borders on an obsession really! If you can give me a lovely liquid to slurp up with some crusty bread I am in heaven. Meat, no meat, I don’t care. There is something calming and comforting about a nice warm bowl of soup (and I am not leaving out its brothers stew, chowder, or chili). I don’t quite know why I feel this way but I know I don’t stand alone on this one. Soup lovers of the world UNITE!! For years now I have had one canned soup that I still crave. Well it isn’t really canned, it comes in those microwavable bowls, but it is premade and I love it. 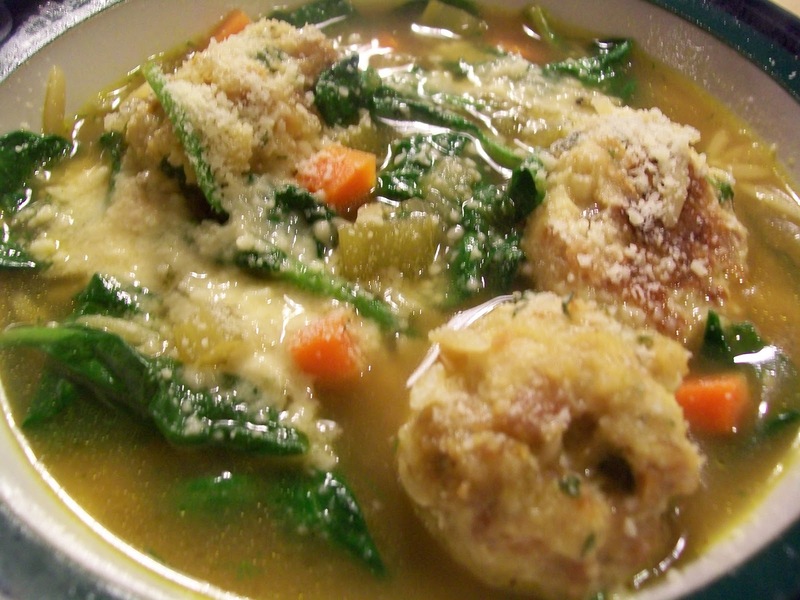 Healthy Choices Italian Wedding soup. When I was working it was my lunch of choice at least 2 or 3 out of a 5 day week. Yet I never tried to make it at home? Why you ask? Hmmmm good question! Maybe I was afraid it wouldn’t be as good, maybe it was just laziness. I mean I actually LIKED this premade soup so it was pretty easy to just have Chef Mike run the show. Now that I have been venturing into making some healthier recipes I decide I need to give this one a shot. I mean lets face it, a lot, and I mean a LOT of the soups that are “comforting” are creamy and thick and probably NOT the healthiest they could be. I knew this one would be different. So I gathered about 4 different recipes and started forming my plan of attack. Picking and choosing the things I liked from each one to try and make the best soup possible. WOW I was hoping it would be good but I had no idea how good it would be!! I made a comment on my Facebook page “Italian Wedding Soup is heaven in a bowl” WHO KNEW? I made about 35 meatballs and a lot of broth and 3 people were able to woof it all down and want more. Well Kevin hid some in a Tupperware container for his lunch the next day, but STILL. All you heard was slurp slurp “WOW” slurp slurp “OhEmmGee this is good” slurp slurp “Is there any more”?? I honestly can’t wait to make it again! 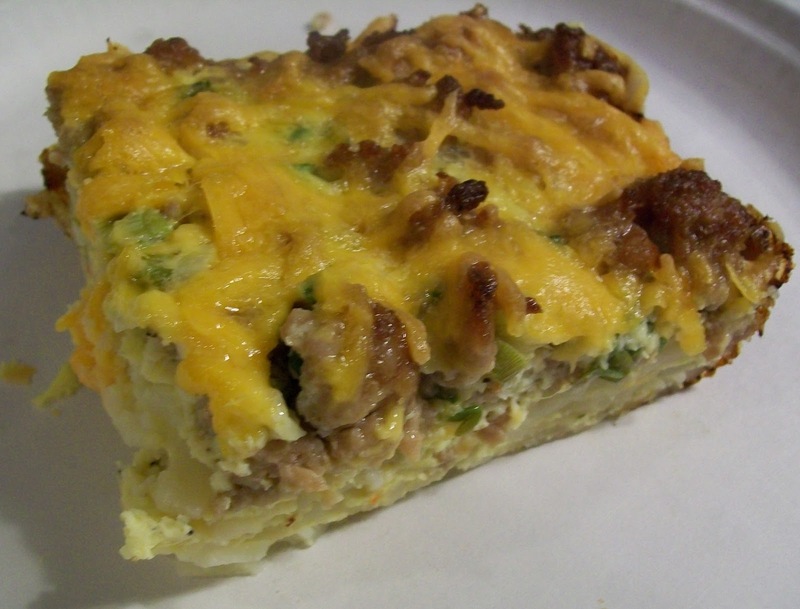 Ever since I made the Make Ahead Sausage Breakfast Casserole I have been thinking more and more about good breakfast recipes. I really do love breakfast but I, as well as many I am sure, have fallen into that breakfast rut. You know, when you try to think of what to make for breakfast you run down the list, Bacon and eggs, Sausage and eggs (OH and don’ forget hash browns), Sausage gravy and biscuits, pancakes, french toast, omelet, etc. At least those are the ones that get bounced around here. Usually we settle on Eggs with sausage or bacon and hash browns. A cheese omelet or egg and cheese muffin sandwich are usually my go to choices through the week. That is IF I eat breakfast. My breakfast as of late has been coffee with cream. Bad I know, but it just seems to be all that I can fit in. OK so if I am going to be boring and some what bad through the week, I want to make up for it on the weekend. This weekend was another winner. I was looking through my Everyday Food Magazine and saw a recipe that I was interested in but knew I wanted to change up a bit. I was really excited to have found another original recipe to surprise everyone with. 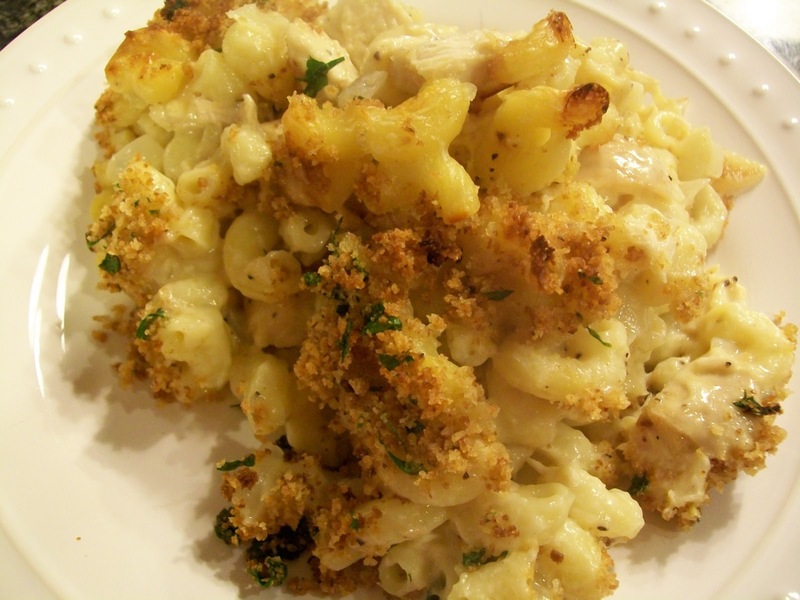 The thing about this recipe is that it is super easy and not that expensive. If you don’t want to use the packaged hash browns you could grate your own. Make sure you wrap them in a clean kitchen towel and squeeeeeeeeze all the moisture out of them that you can. I used the packaged hash browns that you can find in the refrigerated section (usually by the eggs) just because it meant less work on the weekend and THAT was one of my goals. 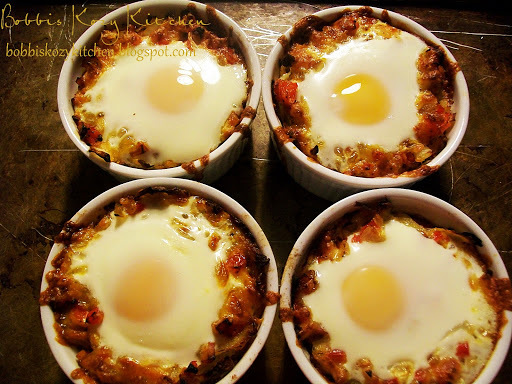 This recipe makes 4 to 6 depending on how large your ramekins/muffin cups are. I used 4 ramekins that I have for making creme bruelee (now ask me if I have ever made that creme brulee that I bought them for), but you can use the jumbo muffin pans and then it will make 6. Coat ramekins or jumbo muffin cups with non stick spray. In a large microwave safe bowl, melt 4 teaspoons of butter. Add 4 cups hash browns and 2 egg whites, season with salt and pepper, and mix thoroughly. Place approx 1/2 cup of the mixture into each muffin cup (more if using ramekins). Firmly press into the bottom and up the side of each cup forming a “crust”. Bake 15 minutes. Meanwhile in a small non-stick skillet, heat 1 tablespoon olive oil over medium heat. Add the onion, bell pepper, and ham steak. Cook stirring occasionally, until the onion is softened, about 7 minutes. Season with salt and pepper. Divide vegetable misture evenly between the cups and top with cheddar cheese. Bake for 2 minutes. Remove from the oven and crack a large egg into each cup, season with salt and pepper. 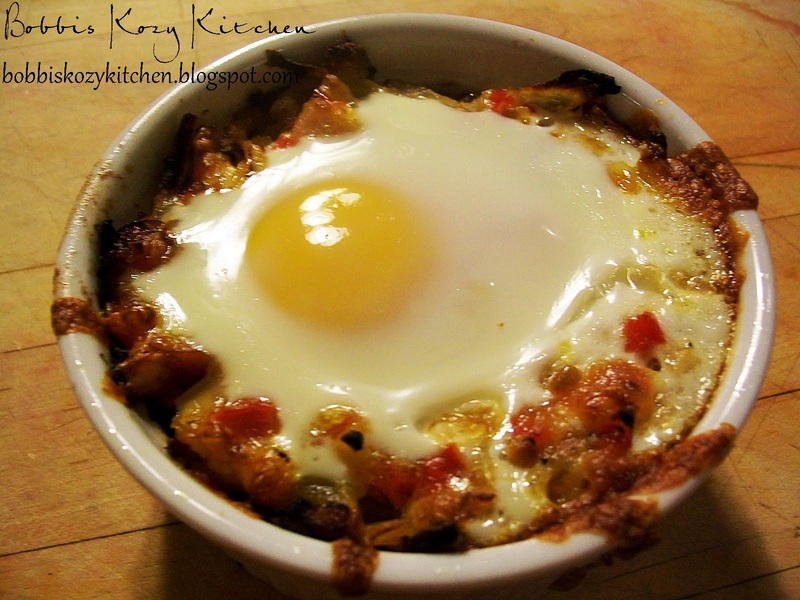 Bake until whites are set but yolks are still creamy, 8 to 10 minutes. If using muffin cups use a small offset spatula to remove the omelet cups from the pan. If using ramekins serve as is. It is so flattering to be recognized by my peers. As food bloggers we put our heart and soul into what we do because that is our passion. So when someone I respect singles me out for an award it is such an honor. 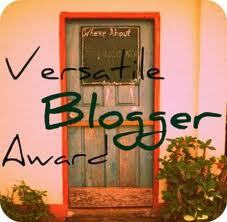 That is what Candi from The Devilish Dish did by giving me this award. Thank you so very much Candi for putting a smile on my face and making my day!! There are so many more that I could list! I wish it wasn’t just 5. 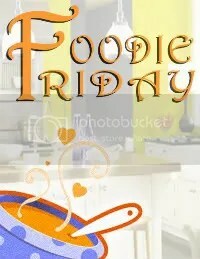 But please make sure to check out other wonderful blogs by clicking on the links to the left hand side of my blog!! OK you asked for it so here it is….Bobbi on a Budget TADA (and the crowd goes wild)! Ahem….OK let me reel myself back in and be a bit serious here. I was very happy when the votes came in and I saw that people wanted a budget post on a regular basis. With the economy the way it is and so many people out of work, it just makes sense that many of us can not afford to cook whatever we want whenever we want it. The dilemma? Trying to cook healthy (or at least healthiER) on a limited budget. That is something I struggle with all of the time. I love to use fresh produce and fresh herbs and, let’s admit, that isn’t “budget” cooking. A suggestion, look for things like canned tomatoes, tomato paste, stocks, beans, etc. All of things that are staples in your pantry. If you use dried spices a lot (I use a lot of cumin and coriander) grab those when they are on sale too. Again, probably not something you didn’t know but something I am having to learn quickly. I took a little help from Melissa d’Arabian for my first post to get me started and in the swing of things. I have to admit I thought there was no way I could feed my 3 hungry guys for $10 but I was shocked and pleasantly proven wrong. With the white beans they end up being quite filling. They all loved this meal and there was enough for everyone. I was lucky enough to have the O Olive Oils that I won in the eRecipecards.com challenge, so I used the Tahitian Lime oil for this recipe. But regular olive oil is just as good. I am sure some of you are wondering what in the heck “Snowmageddon” is. Well over the last couple of days Mother Nature has seen fit to open up the skies and dump more snow on the Western Washington area than we have seen in years! To ad insult to injury she has decided that a good old fashioned ice storm is just what is needed after a foot (or more in places) of snow. Needless to say I am stuck at home. Nothing drives me crazier than being cooped up. Even though I may not have had plans to go anywhere, just the idea that I can’t if I wanted to makes me nuts. So I decided a distraction is what I need. My cabin fever translates into wanting to make somebody smile. 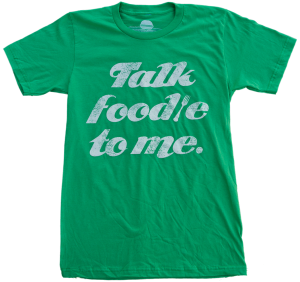 This giveaway if for a shirt that I found at BurgerJunkies.com. I fell in love with it and bought one for myself and one for my daughter. Then I got to thinking “Hey” I bet I am not the only one that would like this shirt. SO I thought of all of you. I love Love LOVE breakfast! But not so enthusiastic about being the one that has to get up and make it. Just being honest here. I can make a mean breakfast for dinner, but something about getting my rear out of bed to cook, and make dishes that need to be done, all before I have had some coffee and everyone else has gotten up. Sooooo the idea of a make ahead casserole that you put in the fridge and then pop into the oven when you feel like eating was one that I ADORED!! I had made one years and years ago for Christmas day with ham and cheese and bread etc. but I don’t know what happened to my recipe. Plus I wanted to try something different. I know Kevin loves sausage, eggs, and hash browns for breakfast so that was my jumping off point. I jumped off and ran with it. This is seriously so simple it is ridiculous. Which makes it even better in my mind. I love pouring my love and time into main dishes but for some reason, breakfast, not so much. So the fact that I made dinner and then could jump right on this to get it ready was awesome. All you do it a bit of browning, chopping, and put it all together. You could add more to this is you want. The possibilities are really endless. If you want more Italian flavors I would use Italian sausage (and they do have Italian flavored turkey sausage now), Parmesan cheese, flat-leaf parsley, and use an Italian seasoning blend to flavor the eggs. WOW now I am kind of excited about breakfasts!! Spray a casserole dish with non stick spray. Add the hash browns to bottom and spread them out evenly. Top with the browned sausage. In a medium bowl add eggs, milk, green onions, dry mustard, salt, and black pepper. Whisk to combine. Pour egg mixture evenly over the sausage. Top with the shredded cheese. Place in refrigerator overnight. In the morning preheat the oven to 350 degrees F. Place casserole in preheated oven and bake for 45 to 50 minutes, or until eggs have set up (test the middle of the casserole with a knife). 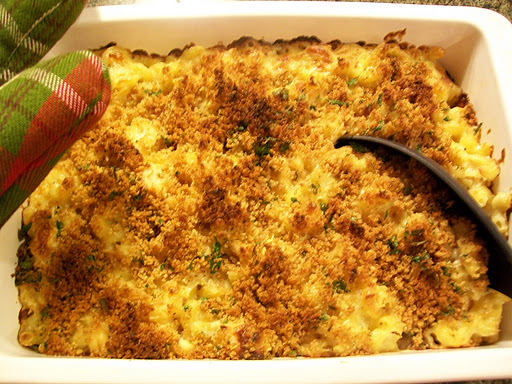 Let casserole cool for 5 to 10 minutes, cut and serve. Everyone in this house loves pasta. It is the one thing I know I can make that EVERYONE will be happy to see it on the plate. I will say, I am pretty lucky because the people that I cook for are appreciative of every meal that I make. Kevin’s son Dylan said the other day “Bobbi your dinners are like a 5 star meal every night”! OK well you know that is the quickest way to my heart right? Flattery will get you EVERYWHERE (except out of the dishes). I knew I wanted to do something with fennel. I have developed a love for the flavor of fennel over the last few years. Roasted, raw, sauteed, you name it, I want it. I had seen a recipe Rachael Ray had done along these lines and decided it would give me another way of sneaking chicken in on Kevin without him feeling beef deprived. I mean if I can pack a ton of flavor into a chicken dish he won’t miss beef right? One can only hope. 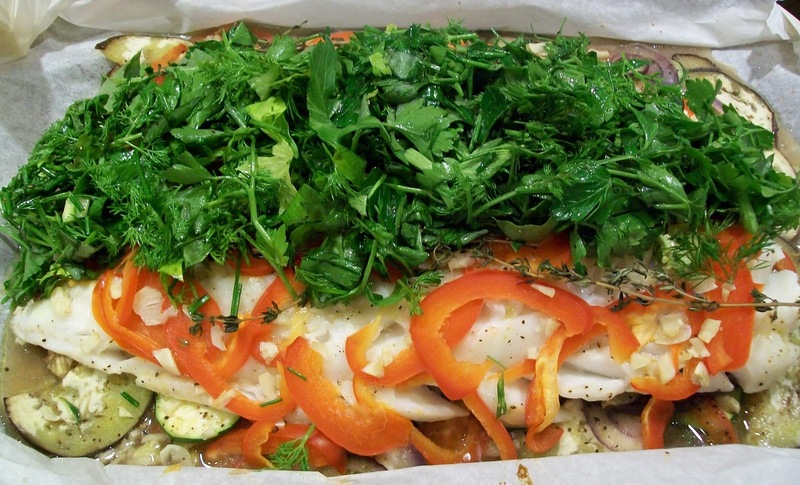 OK I know that is a mouthful (and a tasty one at that, trust me) but really it is just fancy talk for cod cooked in parchment paper with a truck load of vegetables and a yummy herb salad on top of it all. But I figured that wouldn’t fit as a title so I went with the foo foo wording. I was really excited to cook fish again because it gave me the opportunity to use some of my O Olive Oils. Remember I won the O Olive Oil and eRecipecards.com recipe challenge a while back? Well they sent me some of the olive oils I won and they have been staring at me from my counter saying “use me, use me! !” I didn’t marinade in the oil, which afterward I thought “dangit why didn’t I marinade?” but I did give the veggies and fish a good dousing of their Myer Lemon Olive Oil. I can’t say enough about their oils. The crush process they go through just gives the oils a fresh clean flavor. You can actually taste the fresh fruit in them sooooo yummy!! I also got to break out the new Cuisinart food processor Kevin bought me for Christmas. He was disappointed because he thought he bought the one with the wide feed tube, but I am happy with it. I can chop the bigger stuff if needed. It sure made quick work of my zucchini I can tell you that! But enough about my toys and gadgets. Lets talk about the food. I have to admit, this recipe looks a lot harder than it really is. The hardest part is slicing all the veg (unless you have a food processor…or a sous chef hehe). Once you get the fish in that paper the oven does all of the work. No worrying that you have overcooked the fish or wondering if you should flip it over yet. Bing, bam, boom, fish done. 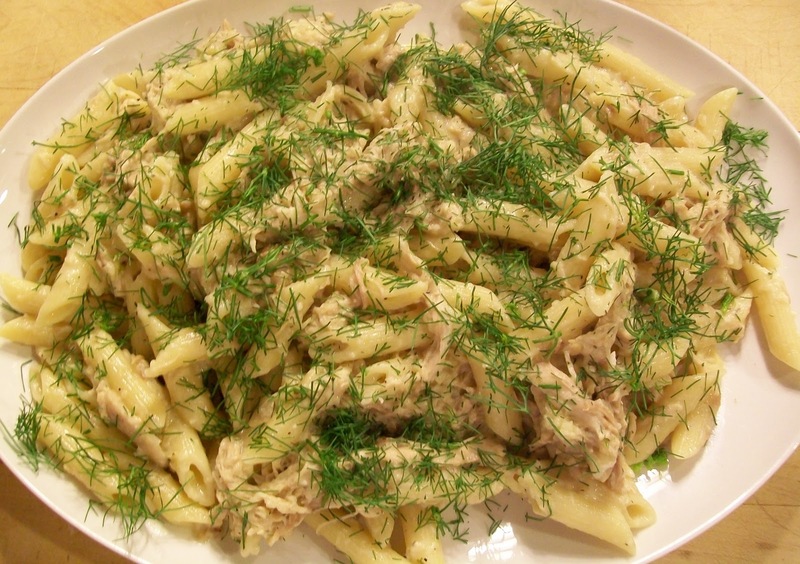 Top it with the herb salad and you have a wonderfully healthy and tasty meal that the family, at least my family, will gobble up in no time flat! We had 2 pounds of fish for 4 people and I only eat small portions because of my surgery. So I will say that between the 3 of them they consumed 1 3/4 pounds of fish in mere minutes! Even if you aren’t a big vegetable person (this has eggplant which I know some people will say eeewwww to right off the bat) the veggies are sliced so thin and they cook in the oilive oil, butter, and white wine which gives them an amazing flavor. A great way to get your vegetables without having to eat plain boring ones. Oh, little side note, my parchment paper was not wide enough to wrap completely around the fish so I topped it with another sheet and folded up the sides. I even secured them with paper clips just to make sure it stayed sealed so all of the yummy steam and juices properly cooked the fish and veggies. I know the dish looks a bit “rustic” but it is oohhhh sooooo yummy!! 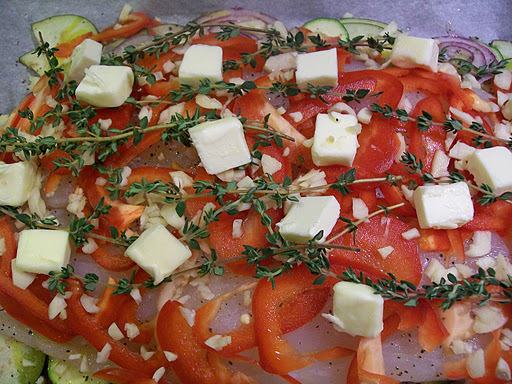 This is the fish all piled up on the veggies and buttered up ready to go into the oven. When it comes out you cut open the parchment paper and top it with the herb salad. 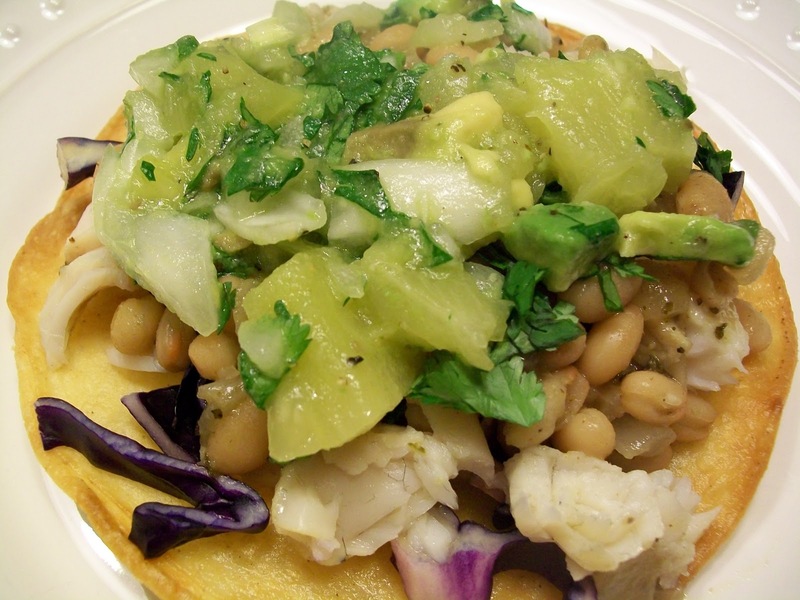 And then…..Viola a beautiful, healthy, and darn tasty dish!! For the cod ratatouille, cover a baking sheet with a piece of parchment paper that is about 2 inches wider than the baking sheet on all sides. Alternate the sliced vegetables along the length of the sheet making sure they are tightly aligned and long/wide enough to just peek out from under the fish. Season with salt and pepper. 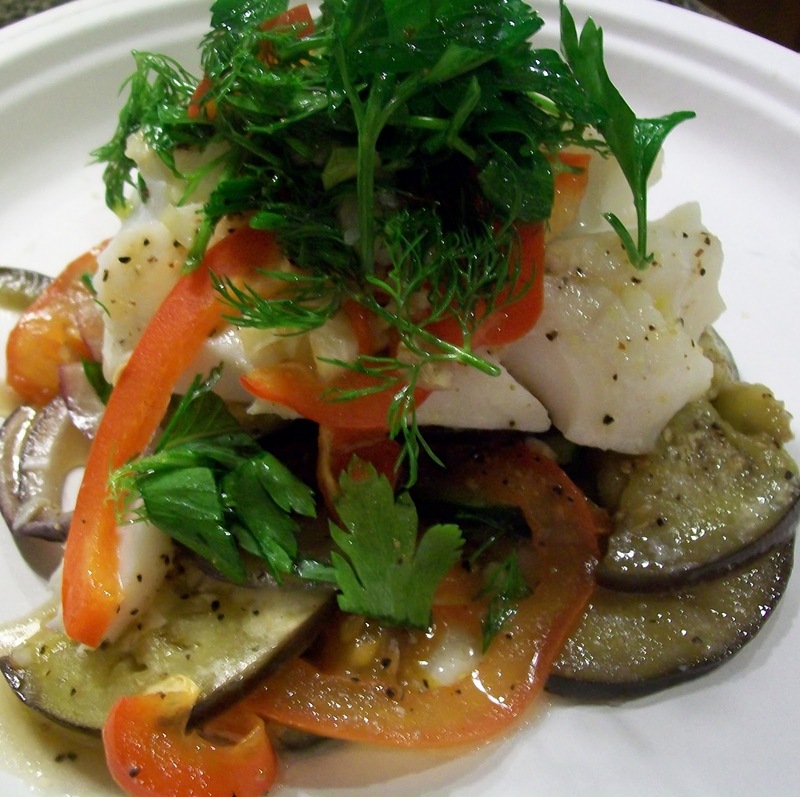 Lay the fish on top of the vegetables, drizzle with olive oil and white wine, season with salt and pepper. Top with the red pepper, garlic, and time. Then dot it with the cubes of butter. Top the fish with another sheet of parchment paper of the same size and roll/fold the sides and then ends up to seal the fish and veggies in tight (like I said I used paper clips to ensure it was sealed right). Bake in the oven for 20 minutes, until the fish is flaky. Meanwhile to make the herb salad, add all of the chopped herbs into a medium bowl. In a small bowl combine the balsamic, olive oil, and salt and pepper to taste. Whisk it up and pour over the herbs. Toss with your fingers to get it combined. When the fish is done cut or tear the top open and top with the herb salad.